Whether you want it for graphic design, photography, programming or just enjoying high definition movies, there will always be a place for the gut-wrenchingly powerful 17-inch laptop. 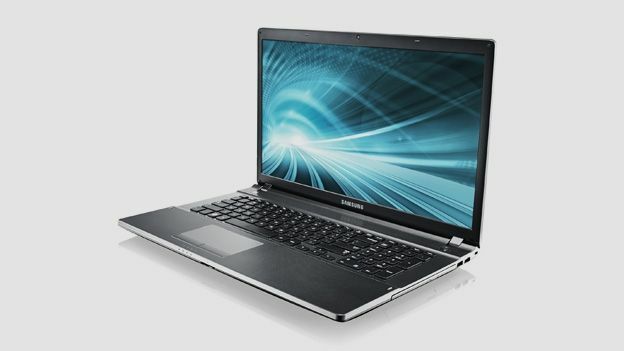 The Samsung Series 550P has enough power to deliver on these demands and challenge the likes of the Macbook Pro and Toshiba Qosmio X870 in the 17-inch arena. The enlarged chassis means not only the latest and greatest internal components, but also a spacious keyboard and responsive trackpad. Other large laptops, like the HP Envy 17 and Dell XPS 17, have impressed us with a blend of usability and power, and the Samsung Series 550P is no different. Elsewhere, the 550P is packing a built-in Blu-ray drive that will come as a relief to those who still buy software on discs or have an extensive movie collection. If you're more the digital sort, the 1TB on-board storage is enough for a very healthy collection of music, movies and games and the hardware here gives you the means to enjoy them. Alongside the 17.3-inch screen are integrated JBL speakers with a solid speaker bar running the length of the screen and a sub-woofer tucked underneath the chassis. Samsung has bumped the pixel resolution of the 17.3-inch screen up to a 1,600 x 900 HD+ display. You won't manage 1080p visuals but can still enjoy 720p high definition. The 550P screen has been given a matte finish which dampens down any reflective glare, letting you use it comfortably in well lit areas. Even though this is a big machine, Samsung has kept the bezel down to a reasonable size. It doesn't interrupt viewing and gives the screen as much room as possible with which to impress you. The aforementioned Intel Core i7-3610QM is backed up by 8GB of RAM and a dedicated Nvidia GeForce GT650M graphics card. These specs qualify the Series 5 550P to run the most demanding programs like video editing suites or music mixing software. The Nvidia GPU adds an extra 2GB of dedicated video memory and means you can use the 550P as much for gaming as working. So it's time to refresh that Steam subscription. In theory the low-voltage Core i7 processor uses less power with better results, however the battery result for the Samsung Series 5 550P came out at a distinctly average 195 minutes during our tests. However, the 3kg weight and 17-inch screen means portability isn't this laptop's strong suit. The Samsung Series 5 550P is an extremely capable 17-inch desktop-replacement machine. Several features, such as the built-in Blu-ray drive and dedicated Nvidia graphics make it ideal for multimedia purposes. The standout keyboard and HD-capable screen also deserve a mention. Portability suffers due to a 3kg weight and average battery life, but that's not what this laptop is about. Instead, the Samsung Series 5 550P stays on your desk and offers enough power to take care of all your most demanding programs.